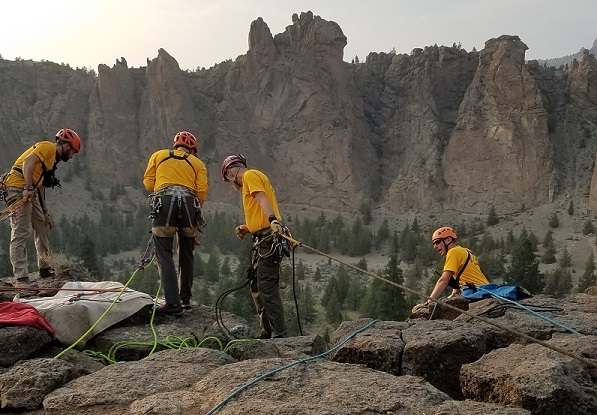 TERREBONNE, OR -- A 32-year-old climber was hurt in a fall at Smith Rock State Park, Wenesday afternoon. Aaron Clark, of Gresham, is reportedly familiar with the area and was traversing a traditional route on the north point trailhead with gear, when he fell about 25 feet. Redmond Fire personnel responded at about 4:30, along with 22 Search and Rescue volunteers and two Deschutes County Sheriff's deputies. They used a rope-rescue system to pull Clark up in a litter. He was then taken by ambulance to St. Charles Redmond for evaluation and treatment.